Rumaan Alam’s first novel, RICH AND PRETTY, earned plenty of critical attention, in part, at least, because he was a male writer depicting characters --- wealthy young women --- whose biographies bore little resemblance to his own. In THAT KIND OF MOTHER, Alam continues to focus his attention on the inner lives and relationships of women. 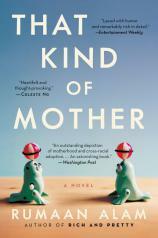 His debut was about young women’s long-time friendships evolving as they become adults; this sophomore effort is about women who --- thanks to the accident of parenthood --- become acquaintances, colleagues and then something far more. Rebecca Stone’s life seems to be playing out a preordained script. It’s the mid-1980s, and she’s about to deliver her first child, much like her idol, Princess Diana, who has just given birth to Prince Harry. Just like Diana, Rebecca was once a preschool teacher, until she quit when she married Christopher (who just happens to be British). Now the couple lives outside Washington, DC, where Christopher has an enviable job at the embassy (and, much to Rebecca’s envy, has actually met Princess Di). Over the next dozen or more years, Rebecca continues to revisit Di’s image, evaluating her own successes and failures --- in motherhood, in her career, in her marriage --- in light of her beloved princess. "Alam’s novel, in addition to providing a striking portrait of one privileged woman’s inattention to the particularities of her black loved ones’ lives, vividly illustrates just how far our country still has to go when it comes to recognizing and celebrating the humanity of our fellow human beings..."
However, these parallels play out in the background of Rebecca’s more urgent personal drama. After initially struggling to breastfeed her son Jacob, Rebecca is assigned to a lactation consultant, Priscilla, whose advice reassures her and builds her confidence. Almost without intending to, Rebecca offers Priscilla a job as Jacob’s nanny --- and she won’t take no for an answer. Over the next couple of years, Priscilla cares for Jacob to give Rebecca a chance to (often halfheartedly) pursue her poetry writing and, in general, maintain the kind of self-care and relief from Jacob’s demands that is afforded by Rebecca’s whiteness and class privilege. Just as Rebecca has reached a major professional milestone --- her poetry is being recognized and appreciated at last --- Priscilla, who is black, reveals that she herself is expecting a baby, coincidentally at the same time that her newly married daughter is pregnant. At first, Rebecca and Christopher are both surprised (Priscilla is in her early 40s and unmarried) and uncertain about what this means for their own family’s future. But when tragedy strikes, Rebecca makes a surprising choice that will deeply affect their family’s life and, eventually, force Rebecca to confront her own unrecognized biases. With a time frame that stretches from the mid-1980s to 1999, THAT KIND OF MOTHER includes a fair number of knowing cultural references, pointing out how much of what we took for granted then --- from Bill Cosby to presidential heir apparent Al Gore --- we might now view in a very different light. And certainly the kinds of casual racism exhibited by some members of Rebecca’s circle would (one hopes) be called out today in a way that it would not have been 25 years ago. But Alam’s novel, in addition to providing a striking portrait of one privileged woman’s inattention to the particularities of her black loved ones’ lives, vividly illustrates just how far our country still has to go when it comes to recognizing and celebrating the humanity of our fellow human beings --- and truly listening to one another.